3 days till Valentine day! Home » GO DUTCH ! » 3 days till Valentine day! Posted By Katia Millet on Feb 11, 2019 in GO DUTCH ! Today on my blog a lovely satin outfit by GraffitiWear which you can find at the 19-3 round of the Designer Circle which runs till February 16th. And a great Love Pillow hug Valentine pose by CNZ also at the Designer Circle. The rest of the post are outfits which are great for Valentines day which I found on Marketplace for 1 L$ or free. And lovely shoe sby Lindy Modern & Retro Shoes which you can find at the Designer Showcase (runs till February 28th). This hunt runs till February 28th and the hunt item you are looking for is an arrow. * Liberty Hair base by Avada. Works for classic avatars, Catwa, Lelutka and comes as Omega applier. 200 L$ (more hair base appliers available). * Satin blouse & Satin skirt in DARK tones by GraffitiWear is available at the Designer Circle for 99 L$ for the skirt and 99 L$ for the blouse. A colour change HUD with 10 colour options is included. Fits Maitreya, Belleza and Slink and comes in mesh and fitmesh sizes. * Bonnie pumps by Continuum are available at the Designer Circle for 199 L$. 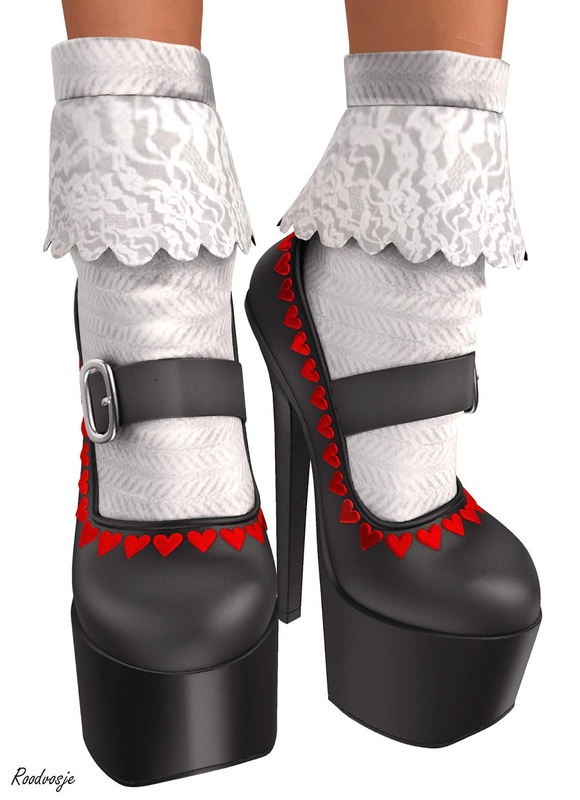 They fit Maitreya, Belleza, Slink, Altamura. You get a red and a black version. * Love Pillow hug Valentine pose by CNZ also at the Designer Circle. It’s yours for 150 L$ including colour change HUD. * Winona by Little Bones from their lucky boards (there are 2 at the store – no group needed). You get a fat pack of this hair. * Heart cut Sweetheart dress by Extal is free on Marketplace. Other colours are available too for FREE. Comes in 5 mesh sizes. * Valentina shoes & socks by Lindy Modern & Retro Shoes which you can find at the Designer Showcase (runs till February 28th). Fits Maitreya, Belleza, Slink and classic avatars. * Snow Bound Bracelet by Snow Sweetwater, free on Marketplace. * Lenor necklace in red by Maiden Couture – available in many colours, 1 L$ each on Marketplace. * All shoes by Lindy Modern & Retro Shoes which you can find at the Designer Showcase (runs till February 28th). * Kya Valentine’s Formal red gown by L.C. Fashion 1 L$ on Marketplace. This dress fits Maitreya, Belleza and Slink and comes as Omega applier. * Corsisi Riera set by Luminesse in 2 versions available at Swank event. They are just 99 L$ each! This is such a beautiful set, goes perfect with gowns but also lights up any simple dress. Don’t miss out on it! * Sienna dress by L.C. Fashion, 1 L$ on Marketplace. Fits Maitreya, Belleza and Slink. Hearts make it perfect for Valentines day. * Finesmith Mango Diamonds jewelry set, 1 L$ on Marketplace.